Ken's Transport currently has two divisions: tankers and flatbeds. 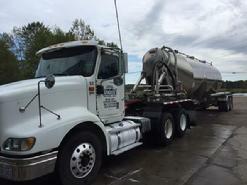 Most of the business is done with the tanker fleet, but Ken's Transport is looking to expand operations in the flatbed fleet. The tanker division was started when Ken's Transport opened its doors in 1976. Today we have almost 20 tankers in the fleet. These are pneumatic tankers used to haul dry bulk materials, mostly sand or bond. We primarily haul to manufacturing plants, but also do filter jobs as well. The flatbed division was started in 2007 and has grown to a fleet of 11 flatbeds. Ken's hauls bagged sand, lumber, and nursery products. The flatbed division is continuing to grow.